Of course, she will scoop this summer! Amazing, unforgettable ice cream made by the founder! Meade Creamery is a local summer tradition for townspeople and lake vacationers alike, with one-of-a-kind ice cream flavors invented during World War II. Only Miss Meade knows the recipes, so if she ever stops making the ice cream, what will the scoop girls do when the stock runs out? More importantly, what can head girl Amelia do when Miss Meade’s great-nephew arrives with big plans to change the stand!? You can find this April 2018 release at your local library or independent bookstore. What’s your favorite “tastes like summer” ice cream flavor? Book info: Stay Sweet / Siobhan Vivian. Simon Schuster BYFR, 2018. [author site] [publisher site] Review copy and cover image courtesy of the publisher. My book talk: With their stock of secret-recipe ice cream dwindling, head girl Amelia tries to lead this summer’s Meade Creamery girls as older scoopers taught her. But when the founder’s great-nephew Grady’s arrives with spreadsheets and profitability concerns, she must balance his demands with local expectations, while trying to find the recipes that Molly Meade created when her sweetheart didn’t return from World War II. Molly’s wartime letters to her best friend alternate with Amelia struggles today at the ice cream stand with her best friend and new scoop girls as they work to keep a local tradition alive for one more summer, despite Grady’s business major viewpoint and Amelia’s growing feelings for him. Listen, listen to maker-stories – free this week! This week’s free audiobooks from SYNC include stories about young women creating something personal and important. Download these complete audiobooks from Thursday through Wednesday 24-30 May, so you can listen to them using a free Audible app, as long as they’re on your computer or electronic device. Click on the link for either or both books to start the simple download process. Bee discovers that her baking reflects her moods, a rare gift that takes the 12 year old orphan from small village to castle to pirate ship as she helps a new (and royal) friend escape an evil mage. What stories about creating and making would you recommend? kids dream and delight in food! Good food can help us as much as good medicine, as these food-filled poems and their embellished photos show. Look for this so-yummy poetry collection at your local library or independent bookstore. Book info: A Moose Boosh: A Few Choice Words About Food / Eric-Shabazz Larkin. Readers to Eaters, 2014. [author site] [book Facebook page] [publisher site] Review copy, cover image, and page images courtesy of the publisher. My book talk: Slippery noodles in rhythm and rhyme, dreams of bread and my own cooking show fill this book of fun food poems. Why did the chef send a moose that I didn’t order? What did the corn say to the cob? Where does food grow? Where did my pet cabbage go? Readers will enjoy sampling these “choice words” about all stages of food – fancy or plain, appetizer to dessert – with doodled-up photos to match. We are what we eat?? Listen up! How much should we worry about the effects of the foods we crave? This week’s free audiobooks from SYNC pair a fictional story with fascinating research so you can read with your ears! Click the link after either title (or both!) to download these complete audiobooks – for free – from Thursday through Wednesday (13-19 July). Then you can listen whenever you want – just be sure to keep the files on your computer or electronic device. Sugar doesn’t want to be fat or take care of her housebound morbidly obese mom in their run-down trailer. When a new guy at the 17 year old’s New Hampshire high school actually listens to her instead of mocking – what now? Perhaps it’s not the exactly carbs and fat we eat that are ruining our health, but the man-made flavors added to them that make us eat more and more. Fascinating research on chemical food flavors may be interfering with our bodies’ ability to choose nutritious foods. What food has your own research led you to avoid? Mom’s offbeat depression remedy (“just bake the perfect cake!”), therapist’s soothing talk (and he is just so cute! ), trying not to disappoint friend Elle and new co-worker Alex (but sometimes even putting on her sandals is too much effort) – Molly isn’t exactly reveling in her summer before senior year as depression digs its claws into her. Find the May 2017 paperback or 2016 hardcover at your local library or independent bookstore to see how Molly copes with change, her bake-happy mom, and trying to throw off the crushing load of depression during all 100 Days of Cake. When is it okay to pass on advice that might be more placebo than not? Book info: 100 Days of Cake / Shari Goldberg. Atheneum Books for Young Readers, 2016 (hardcover), 2017 (paperback). [author site] [publisher site] Review copy and cover image courtesy of the publisher. My book talk: The waves of depression keep getting deeper for Molly during summer before senior year, as the Florida teen wishes that therapy really would help her, longs for her so-cute therapist, and wants everything to stop changing so she has time to get better. Her successful hairdresser mom is certain that the 100 Cakes Challenge will perk up Molly, her best friend Elle is easing away, and FishTopia’s owner wants to sell out. Without their job together, what will happen to her sorta-relationship with Alex? How can she think about the SAT and college choices when she’s too tired, all the time? Why can’t she just spend all day talking about music with dreamy Dr. B? Read with your ears, then eat informed! This week’s free audiobooks from SYNC help you think food as you read with your ears! From Thursday through Wednesday (30 June to late night 6 July), you can download either or both of these these complete audiobooks for free, then listen to them whenever you like, as long as you keep them on your computer or electronic device. Click on the link following each title to go to the SYNC site now (you’ll need Overdrive app to listen; free download link there, also). Journalist/food detective Pollan explored conventional and organic farms, hunting, foraging, mega-corporations and small enterprises to see how food gets to your table and how you can make informed choices about what you eat. What summer food will you snack on as you listen? Incredible Adventures of Cinnamon Girl, by Melissa Keil (book review) – end of the world? with pastry? (d) all of the above, plus a demand for vegan choices at Mum’s bakery (where they live, too). Published in Australia in 2014 and brought to the USA by Peachtree Publishers in 2016, the longing and love story of Cinnamon Girl is so worth asking for at your local library or independent bookstore – you’ve got to find out if the world ends, right? So, the world ending – caused by humans, nature, aliens? 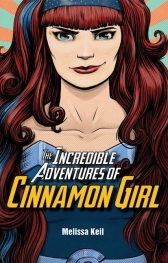 Book info: The Incredible Adventures of Cinnamon Girl / Melissa Keil. Peachtree, 2016. [author site] [publisher site] Review copy and cover image courtesy of the publisher. My book talk: Alba and Grady have been best buddies forever, but when a psychic’s ‘end of the world’ pronouncement names their little Australian town, the recently graduated teens must cope with strangers in the pasture and old friends with new perspectives, as she wants everything to stay the same and he longs to head for college. Can’t she be a brilliant graphic artist without leaving her tiny hometown? If her dad hadn’t died in a motorcycle crash and Grady’s dad hadn’t fled for the city, what would life be like now? More than just cupcakes, Mug It! serves up single-serve portions of breakfast yummies, savory supper choices, and worth-the-splurge sweets. 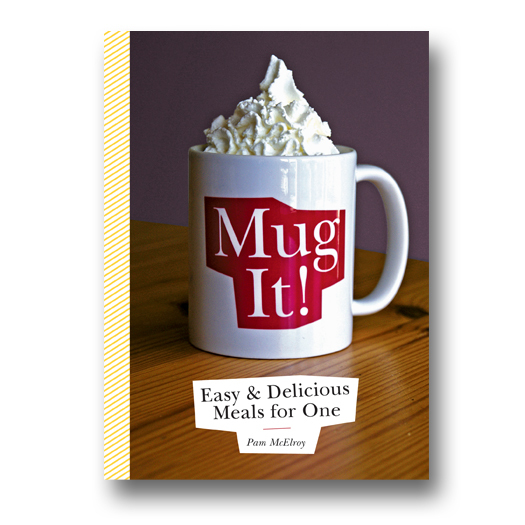 Hit up your local library or independent bookstore for this September release, grab your favorite microwavable mug, and cook yourself happy! 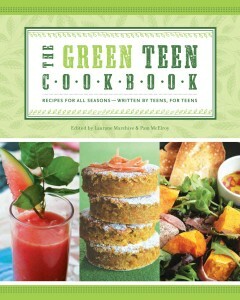 If Pam’s name sounds familiar, you probably remember The Green Teen Cookbook she edited (my recommendation here). Now, if you’ll excuse me, I hear that Chocolate Peanut Butter Cake calling my name! Book info: Mug It! Easy & Delicious Meals for One / Pam McElroy. Zest Books, 2015. [publisher site] Review copy and cover image courtesy of the publisher. My book talk: Cooking for one gets a new twist with microwaved mugs of deliciousness and mason jars bearing yummy solo selections when you Mug It! Begin with breakfast, from Overnight Oats with flavor variations that don’t come from a packet to perfect Sunday Quiche and other egg dishes. Liven up lunchtime with a variety of Mason Jar Salads (Spinach Chicken Pesto sounds great) or Seven-Layer Dip in a mug. Mugs go main-meal for dinner with Meatloaf and no-box Mac & Cheese in the microwave. Gotta have dessert, too, so choose from Oatmeal Cookie for one, an oversize mug of Red Velvet Cake with Homemade Frosting, or Strawberry Shortcake. Relax and enjoy the bounty of summer with fresh ideas for Father’s Day feasting! Teens wrote, tested and shared yummy recipes with an eye to sustainable living in The Green Teen Cookbook (my recommendation here), with papa-pleasing choices for carnivores and vegans alike. Perhaps a leisurely brunch with Huevos Rancheros will start your Father’s Day or you’ll choose yummy Oreo Cupcakes as dessert. This 2014 paperback title is widely available. For the funnier side of food, try some of the amazing sandwich creations dreamed up by Adrian Fiorino and chronicled in his Insanewiches (my recommendation here). Present a father in your life with a King Me checkerboard ham and cheese sandwich or the super-detailed wrestling-themed Cold Cut Cage Match. 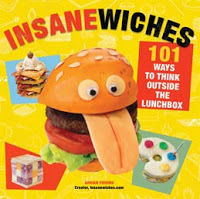 Look for a print copy of Insanewiches at your local library or order the eBook at your favorite independent bookstore. What’s your favorite dish to cook for Dad?